When life gives you Mangoes make Mango Salsa with them:) Here I bring you an easy recipe on how to prepare fresh Mango Salsa. Slurp it by adding this Mango Salsa to Rolls, eat with blue chips or tortilla chips. Its tangy, sweet, colorful, fresh, juicy, luscious and mouthwatering. All you need is some fresh ingredients and some spices commonly found at home. Fresh Mango Salsa used in Rolls. Do try it and let me know how it turned out! 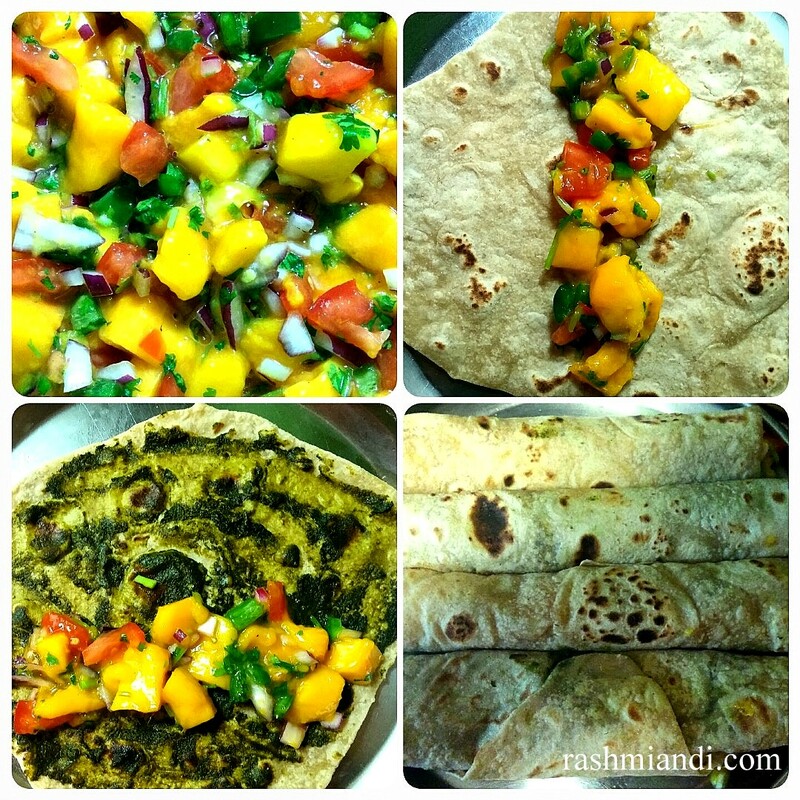 Here I bring you an easy recipe on how to prepare fresh Mango Salsa. Slurp it by adding this Mango Salsa to Rolls, eat with blue chips or tortilla chips. Its tangy, sweet, colorful, fresh, juicy, luscious and mouthwatering. All you need is some fresh ingredients and some spices commonly found at home. Dice all the ingredients small i.e Mango, Tomato, Jalapeno, Bell pepper, Red Onion and keep it aside. Remember to dessed Jalapeno before dicing. Take a bowl, add all the diced ingredients and mix it with a spoon. Squeeze the fresh lemon using a lemon Squeezer. Now add all the spices i.e black pepper and cumin powder and salt and give it a spin using a spoon. Finally chop some fresh cilantro and add it to the mix. Voila! Your fresh mango salsa is ready. Slurp it by adding it to rolls or with some chips. Always using ripe mangoes. And remember to use the tomatoes which are pulpy. Fresh Lemons and Cilantro, altogether lifts the dish to the next level. Dice the Tomato small and i dint deseed them, you can if you want to. Jalapeno, I used 2 cause I like it hot , you can use only one if you don't like it hot, and I deseeded them. Dessed the bellpepper before using. Dice the ed onions small, you can also use white onions but i like mine red. Always remember to add salt at the last before you start eating. You can also add some olive oil, but I prefer mine without oil. Scrumptious….Bookmarking it for next summers.